In the past week, there's been quite a bit of chatter about Radiohead frontman Thom Yorke's decision to pull his music from Spotify, a popular streaming service. In a comment that had many in the industry discussing the economics of digital music, Radiohead producer Nigel Godrich complained that "new artists get paid f--k all with this model." 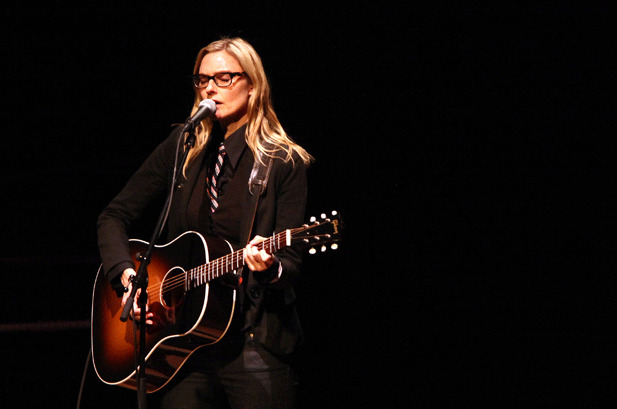 Now comes a lawsuit from another acclaimed songwriter, Aimee Mann, who presents the argument that some artists like herself are being systematically robbed of digital royalties. According to Mann's lawyer, Maryann Marzano of Gradstein & Marzano, "Not only does this case seek redress for Aimee Mann against one of the world's largest but least known providers of online music, it also serves as a call to other artists to follow the lead set by Radiohead and Pink Floyd to put an end to the unlicensed, uncompensated use of their music by online services." In the cross-hairs of the lawsuit is a company called MediaNet, which might be somewhat obscure but plays an important role. The company was founded in 1999 as a venture backed by EMI, AOL, BMG and RealNetworks before being sold to a private equity firm in 2005. Today, it is essentially a white label that serves up more than 22 million songs to over 40 music services including Yahoo Music, Playlist.com, eBay and various online radio services. But according to Mann's lawsuit, not all of the music being provided by MediaNet is properly licensed. Mann is demanding statutory damages for willful copyright infringement of some 120 songs, which could amount to damages as high as $18 million. The laws that govern the distribution of music are no doubt complicated and have grown more complex over time. Every song starts out as a composition, which is protected by its own copyright. When that composition becomes a sound recording, there is a separate copyright that protects that as well. The owner of the sound recording pays a mechanical licensing fee to the owner of the composition. Starting in the 1990s, music began being distributed digitally, and Congress amended copyright laws to extend compulsory licensing to the delivery of phonorecords in digital form. However, the statute didn't apply to certain services that offered on-demand streams and limited downloads. That was confirmed by a New York judge in 2001. To address this absence, representatives from the Recording Industry of America and the National Music Publishers Association began negotiating with each other and reached an agreement whereby RIAA members were able to make payments through the Harry Fox Agency. Later, an entity called the Copyright Royalty Board emerged that set rates and allowed some digital services like Pandora to pay compulsory licensing fees. Other services like Spotify have made direct deals with record labels. MediaNet falls somewhere in the middle of all of this. The company appears to have had an interesting, legally contentious road toward becoming some form of back office aggregator of music for dozens of online music services. After being sold to private equity firm Baker Capital, MediaNet continued to distribute works, which led to a class action lawsuit filed in 2008 by the Harry Fox Agency. That matter was settled in 2008, but another lawsuit came from various song publishers in 2011. According to a declaration that was filed in the case by Stephen Grauberger, an attorney representing the plaintiffs, MediaNet attempted about a decade ago to seek compulsory licenses, but the lawyer said that notices sent by the company "were facially defective" for various reasons including the failure to reference other entities who would utilize the music. Also in Grauberger's declaration (read here) was the astounding claim that sworn testimony had revealed that by 2012, "23 percent of MediaNet's catalog remains unlicensed." The lawsuit was then confidentially settled. Enter Aimee Mann, who hit it big in the mid-1980s with "Voices Carry," earned Academy Award and Grammy Award nominations for her "Save Me" song from Paul Thomas Anderson's "Magnolia," and has been producing critically-celebrated music ever since. According to her complaint (which can be read here), filed on Monday in California federal court, she entered into a license agreement in 2003 with MediaNet (then known as MusicNet). The term of the license agreement was scheduled to end in 2006 but had automatic two-year extensions unless terminated by either party. Mann's representative is said to have sent a termination notice in 2005, but nevertheless, "MediaNet continued after the Termination Date to transmit, perform, reproduce and distribute the Compositions as part of MediaNet's service, despite having no right or license to do so." Besides suing for direct infringement, Mann is also claiming that MediaNet induced its business partners to commit copyright infringement. Mann also says she has not been paid any royalties by the company since Sept. 30, 2005 with the exception of a $20 advance this past March that was returned. MediaNet hasn't yet responded to a request for comment.